I've written my customary preview of SC, which is now published at HPC Wire: https://www.hpcwire.com/2018/11/06/sc18-preview-big-in-dallas/. Over 10,000 members of the global HPC community will gather in Dallas for the SC18 conference. Even a decent sized team will struggle to attend everything the official program has to offer. On top of this, there will be a plethora of public and private meetings outside the official program, many of which are more valuable than the official program. Plus, there will be the usual flood of press releases, social media blasts, etc. Out of all of this, what will emerge as the key themes? What are some essential things to do/attend? Read the @hpcnotes SC18 preview to find out! Tweet me @hpcnotes using hashtag #SC18 to add your reception to this list! 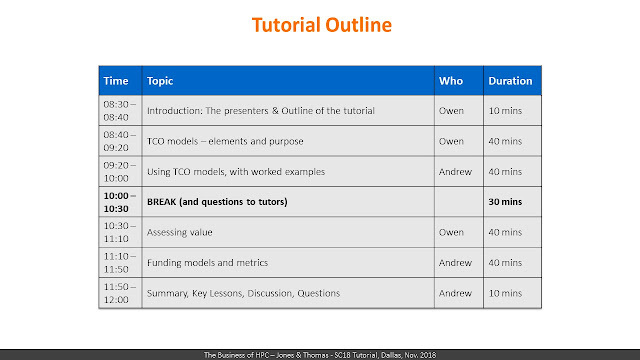 At SC18, I will be leading two tutorials, along with my long-time co-presenter Owen Thomas and new co-presenter for SC18, Ingrid Barcena Roig. 8:30am - noon : "The Business of HPC: TCO, value, metrics, and more ..."
1.30pm - 5.00pm : "Procurement and Commissioning of HPC Systems"
Both tutorials are on Monday 12th November, in room C140 of the Dallas convention center. Please join us to learn more about how to get investment in HPC, how to spend it wisely, and how to measure the impact. Just taken over a HPC management or leadership role? Or hoping to soon? Or know someone who could grow into those roles? Or been a HPC director for years but value ongoing personal development? The HPC Leadership Institute is a partnership between Numerical Algorithms Group (NAG) and Texas Advanced Computing Center (TACC) to deliver training on the business aspects of High Performance Computing. The training covers strategy, total cost of ownership (TCO), cloud vs on-site, supercomputer procurement, governance, user services, and much more. Does it matter whether USA, China, EU, or someone else has the biggest supercomputer? Much fuss will be made over the ORNL's new Summit supercomputer at the ISC18 event next week - in particular the fact that it means the USA replaces China as the home of world's fastest supercomputer according to www.top500.org. This brings the usual question as to whether it really matters which country has the biggest supercomputer. Having a supercomputer 20%, or even 2x, faster than a competitor isn’t critical on its own, because it is possible to make up 20% or 2x actual competitive capability through better software, better people, or better service delivery practices. However, a 10x faster supercomputer would be an issue, because that would typically reflect a political commitment to High Performance Computing (HPC) involving hardware and software and people - and so could mean potential capability dominance. Of course, if you had the 2x slower supercomputer without investing in people/software/practices to make up the difference, then that would be a meaningful competitive gap and would matter. Read more in this article at WiredUK: "Why the US and China's brutal supercomputer war matters"
At SC17, we celebrated the 50th edition of the Top500 list. With nearly 25,000 list positions published over 25 years, the Top500 is an incredibly rich database of consistently measured performance data with associated system configurations, sites, vendors, etc. Each SC and ISC, the Top500 feeds community gossip, serious debate, the HPC media, and ambitious imaginations of HPC marketing departments. Central to the Top500 list is the infamous HPL benchmark. Benchmarks are used to answer questions such as (naively posed): “How fast is this supercomputer?”, “How fast is my code?”, “How does my code scale?”, “Which system/processor is faster?”. In the context of HPC, benchmarking means the collection of quantifiable data on the speed, time, scalability, efficiency, or similar characteristics of a specific combination of hardware, software, configuration, and dataset. 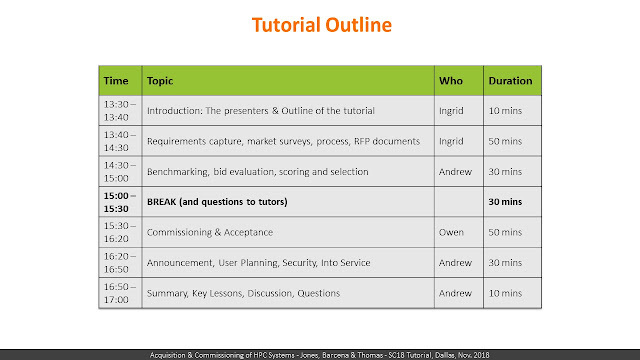 In practice, this means running well-understood test case(s) on various HPC platforms/configurations under specified conditions or rules (for consistency) and recording appropriate data (e.g., time to completion). These test cases may be full application codes, or subsets of those codes with representative performance behaviour, or standard benchmarks. HPL falls into the latter category, although for some applications it could fall into the second category too. In fact, this is the heart of the debate over the continued relevance of the HPL benchmark for building the Top500 list: how many real-world applications does it provide a meaningful performance guide for? But, even moving away from HPL to “user codes”, selecting a set of benchmark codes is as much a political choice (e.g., reflecting stakeholders) as it is a technical choice. High Performance Computing (HPC), or supercomputing, is a critical enabling capability for many industries, including energy, aerospace, automotive, manufacturing, and more. However, one of the most important aspects of HPC is that HPC is not only an enabler, it is often also a differentiator – a fundamental means of gaining a competitive advantage. impact - effectively exploiting the results of the computations in the business. These are all powerful business benefits, enabling quicker and better decision making, reducing the cost of business operations, better understanding risk, supporting safety, etc. choices on the balance of investment across hardware, software, people and processes. The answers to these strategic choices will depend on the environment (market landscape, other players, etc. ), how and where you want to navigate that environment, and why. This is an area where our consulting customers benefit from our expertise and experience. If I were to extract a core piece of advice from those many consulting projects, it would be: "explicitly make a decision rather than drift into one, and document the reasons, risk accepted, and stakeholder buy-in". A key means of differentiating with HPC, and one of the most visible, is through the choice of hardware technologies used and at what scale. The HPC market is currently enjoying (or is it suffering?) a broader range of credible hardware technology options than the previous few years. When buying new workstations or personal computers, it is easy to adopt the simple mantra that a newer processor or higher clock frequency means your application will run faster. It is not totally true, but it works well enough. However, with High Performance Computing, HPC, it is more complicated. HPC works by using parallel computing – the use of many computing elements together. The nature of these computing elements, how they are combined, the hardware and software ecosystems around them, and the challenges for the programmer and user vary significantly – between products and across time. Since HPC works by bringing together many technology elements, the interaction between those elements becomes as important as the elements themselves. Whilst there has always been a variety of HPC technology solutions, there has been a strong degree of technical similarity of the majority of HPC systems in the last decade or so. This has meant that (i) code portability between platforms has been relatively easy to achieve and (ii) attention to on-node memory bandwidth (including cache optimization) and inter-node scaling aspects would get you a long way towards a single code base that performs well on many platforms. However, there is a marked trend of an increase in diversity of technology options over the last few years, with all signs that this is set to continue for the next few years. This includes breaking the near-ubiquity of Intel Xeon processors, the use of many-core processors for the compute elements, increasing complexity (and choice) of the data storage (memory) and movement (interconnect) hierarchies of HPC systems, new choices in software layers, new processor architectures, etc. This means that unless your code is adjusted to effectively exploit the architecture of your HPC system, your code may not run faster at all on the newer system. It also means HPC clusters proving themselves where custom supercomputers might have previously been the only option, and custom supercomputers delivering value where commodity clusters might have previously been the default.